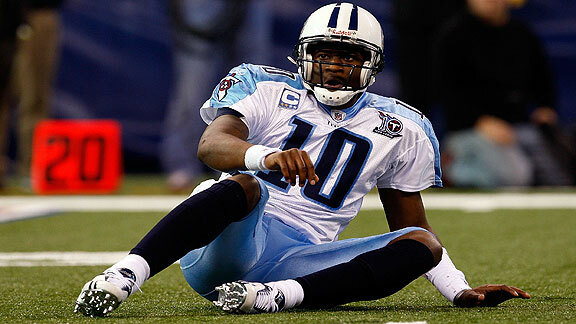 The Tennessee Titans have announced that the team will not be bringing back quarterback Vince Young, which is about damn time. It all came down to the Titans’ owner, Bud Adams, contemplating on who to keep; Vince Young or head coach, Jeff Fisher. Personally, I think this was a no-brainer. I would have my chips with Fisher all the way. Young brings too many issues and distractions to the Titans. The Titans, at one point this season, were legitimate playoff contenders, but Young’s inability to handle pressure crumbled this team. One of the best Rose Bowl performances of all time. Coming out of college, Vince Young was a top quarterback. Hell, he is one of the best college quarterbacks I have seen to step the field. The two Rose Bowl performances he put on were remarkable. The National Championship game against USC was the best performance from a quarterback I have ever seen. Young nearly put up 500 total yards on his own, that is just unheard of, especially in the title game. This kid was simply on top of the world. So what went wrong? A lot……. Regardless of what people think, Vince Young has all the tools and physical attributes to become a franchise quarterback. He has the athleticism, height, and arm strength that most quarterbacks wish they possessed, but the problem was his ability to mature into the quarterback position. Many coaches described his work ethic as “lazy” and as a quarterback that isn’t acceptable. As a quarterback you have to be a leader and being lazy definitely doesn’t help your purpose. Do you think Tom Brady and Peyton Manning are lazy? I sure don’t. The quarterback position all starts in the classroom; one must study film constantly and work on the little things. Since Vince Young stepped into this league, his footwork hasn’t improved at all nor has his throwing motion. The dude still can’t even read simple zone coverages. I can find high school quarterbacks that can recognize coverages better than he can. You figure if you were drafted to become the franchise quarterback for your team that you would work to get better, but Young hasn’t shown half the effort compared to other quarterbacks in the league. Instead, he would rather start fights at strip clubs. The biggest problem, I see, in Young is his inability to handle adversity and pressure. In my opinion this all started from college. Throughout most of his football career, Vince Young was labeled as the “greatest thing ever” since of his accomplishments in college. Now, he is being told that he isn’t good enough and has gotten benched, he hasn’t taken it professionally. At the University of Texas, Young was given all the freedom; especially when your head coach is Mack Brown. During his collegiate days, Young never really faced adversity. He basically had everything handed to him because of his god-given athleticism. This isn’t going to cut it in the NFL. In this league, you must handle adversity both on and off the field. Young simply can’t handle this league. Prior to this season, Young was supposedly having mental issues even resulting to suicide rumors. Is that really what you want out of your quarterback? Even this season, after getting injured and benched, Young decides to lash out on his coach and even gave up on his team. He ended up throwing his pads into the stands. That right there isn’t acceptable from all perspectives. If it were up to me, I would have cut his a## that day. Although Vince Young has talent, he simply doesn’t have the mentality NFL quarterbacks must possess. Injuries have hampered Young as well. That is a good question. The only place I can see Young going to is the Arizona Cardinals at this point. Young is set to be released soon since the Titans aren’t willing to pay his $4.25 mil roster bonus in March, and I highly doubt the Titans will get any trade value out of him. The Cardinals basically have no quarterback at this point. John Skelton? Max Hall? Give me a break. Neither are franchise quality quarterbacks. The Cardinals defense and special teams virtually kept them in games. That would be the best bet for him to land another starting gig in this league. Some may say the San Francisco 49ers or Miami Dolphins, but I would take Alex Smith or Chad Henne over Vince Young in a heart beat. I would even take Troy Smith over the guy. He may even have to settle as a backup if he wants to stay in the NFL. Honestly, if I was an owner or general manager of a team, I would definitely not want a guy like him on my team. A quarterback who gives up on his team and lashes out on his head coach is a big NO NO. I would not be surprised if Young wasn’t part of this league after this season. The predicament he has put himself into is going to be tough to get out. Perhaps, Vince and JaMarcus can join the UFL together! What do you think? Would you want Vince Young as your franchise quarterback? Will he even make a NFL roster next season? Will Sparano be a Dolphin in 2011? All signs thus far point to Kubiak staying on as Houston’s head coach. Owner Bob McNair has all but assured him that he’ll be back because he’s a good guy and he loves Kubiak’s high powered offense. However, the same can’t be said on the defensive side of the ball. As of now, all signs point to Wade Phillips being signed on as the defensive coordinator. They actually do have some familiarity with each other as Kubiak was backing up John Elway when Phillips was defensive coordinator. Overall, I think it’s a solid move. Wade isn’t a good head coach but knows how to build a defense. Time will tell if the defense was the problem this season or if it’s Kubiak. I hate to say it, but I don’t think there’s any chance that John Fox returns. He’s in the final year of his contract and he’s constantly butted heads with the owner, Jerry Richardson. He has had some success with Carolina, but too often do they flame out and have a terrible season after making the playoffs. With Carolina set to finish as the worst team in the NFL, it’s time for change in Carolina. His contract is set to run out and if Carolina wanted to keep him, they would have extended him already. Fox should get another chance as a head coach elsewhere. UPDATE: Today, the Carolina Panthers announced that John Fox and his coaching staff will not return for the 2011-2012 season. Sparano got off to a hot start with the Dolphins taking them from 1-15 the previous season to 11-5 the next season winning the AFC East. However, the Dolphins have slipped back into mediocrity the past two seasons finishing at or right below 8-8. Word out of Miami has been mixed thus far. Players like Brandon Marshall have stepped up to speak in favor of him. What’s definitely not helping is Bill Cowher saying he would like to coach in Miami. Personally, I think they should keep Sparano but the ability to upgrade at the head coaching position may be too tempting for Miami to pass up. Jack Del Rio seems to be in a rhythm with the Jaguars. They always seem to go from a terrible season, to mediocrity, to making a playoff run which makes it hard to get rid of him as a coach. He’s a players coach and has the vote of confidence from the players. Jacksonville could see what else is out there, but it’s probably best that they stick with Del Rio and see where it takes them. As a small market team, Del Rio is a good fit with them and has proven this season that he’s still a good coach in the NFL. I don’t even know what to say about the Cleveland Browns anymore. They beat the New England Patriots one week, and lose to Cincinnati the next. The team has shown more promise this year than it has in the past, but the truth is they will most likely finish 5-11 just like they did in 2009. Word out in Cleveland is that he will be fired after their week 17 game against Pittsburgh. I hate to say it, but Mangini has always been mediocre at best as a head coach so I agree with the Browns if they decide to move on. I could see Mike Holmgren going after someone from his coaching tree like Jon Gruden. Marvin has been the head coach of the Bengals since 2003. Despite the positive image he’s had with the organization, he’s only posted 2 winning seasons and failed to record a playoff win. A good amount of his seasons with Cincy have ended in mediocrity. 2 of his last 3 seasons have been 11 loss seasons as well. Word is he will soon know his job fat next Tuesday. The only thing keeping me from putting his fate from lower is because who would the Bengals sign who would work better? I’m not sure if they have any viable options so they may be best off sticking with Lewis for at least 1 more season. As a Texans fan, I’ve been familiar with Jeff Fisher for several years. Despite his ups and downs during his tenure ant Tennessee, he’s always had a grip on the team. This is the first season that I’ve felt that he’s lost control of the team. It could be he’s burned out or just ready for a change of scenery; at the same time the Titans could use a change at head coach as well. However, it’s like breaking up with a longtime girlfriend; it’s going to be messy because they’re so cemented into everything. Despite all this, there’s no given that Bud Adams will get rid of Fisher. Just like the other situations, he would be a tough coach to replace. Probability of Returning in 2011: ??? I always find it laughable how demanding and impatient fans and teams in the northeast are. They are the reason why I have to put Coughlin on this list, because realistically there is a chance Coughlin could get fired (and I still don’t know why). Since taking over the Giants in 2004, he’s only had 1 losing season in one of the toughest divisions in the NFL. Not only that, he won the Super Bowl in 2007 against the undefeated Patriots. The only way he gets fired is if Bill Cowher takes over, and even then I don’t know how much better he will make them.